The Association of Proprietary Colleges (APC) represents 12 fully accredited, degree granting colleges operating on 23 college campuses across New York State offering associate, bachelor’s, master’s and doctoral level programs. New York State has a long-standing history of working together with institutions of higher education in all four sectors (SUNY, CUNY, independent non-profit and proprietary) to benefit all New Yorkers. This commitment to equality and parity across all sectors has created a robust and diverse education system that has resulted in innovative and novel ideas, a consistent pipeline of employees for local businesses and has had a strong, positive economic impact across the state. Continuing a legacy of academic success for over 100 years, New York’s proprietary colleges have been educating students and helping them achieve their personal, professional and academic goals. In 2018, APC member Colleges conferred more than 3,400 bachelor’s degrees, 3,200 associate’s degrees, 857 master’s degrees and 188 certificates. In total, that is over 7,600 individuals who made a commitment to enhancing their education and improving their lives. 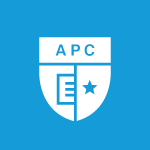 APC is extremely proud of its member colleges’ history of providing educational excellence, access and affordability. 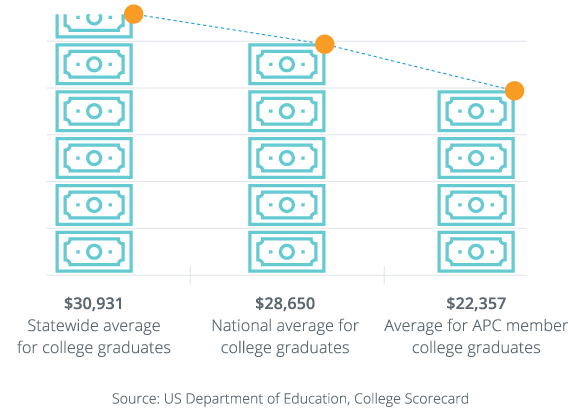 APC colleges are committed to keeping loan debt low; achievement high; and creating a path to employment. Be informed. Facts and Figures page. APC member colleges are New York focused, educating local students for lifelong careers that are in demand in New York. Ninety percent of students attending APC member colleges are from New York and more than 90 percent of those students stay in New York after graduation to live and work. Our colleges educate over 26,000 students and employ more than 6,000 people making them strong economic drivers in their local communities. To learn more about the impact graduates from APC member colleges have on their local communities – visit the APC Impact Page.